The last 50 years have been exciting times with the pace of innovation and technological change consistently accelerating, impacting not only our everyday lives but also more sophisticated and complex fields. 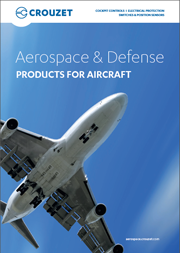 The aerospace & defense industries are no exception to this rise. Crouzet Aerospace is constantly seeking to recognize technology trends at an early stage and to successfully convert them into new product innovations. We regularly organize technology meetings with our customers to share our knowledge and understanding of the future needs and research. For instance, in October we were happy to meet the Airbus Helicopters’ engineering team to showcase our range of cockpit equipment: pushbuttons, trim switches, joysticks, control grips and control wheels. We also shared our latest innovations – new fixation & connection systems of buttons, illuminating buttons and our complete solution of the control grip with integrated plastic tube. “Taking advantage of the latest technology in practical applications is an integral part of our business strategy and a key element of our success“, – comments on the event Bruno Taillet, Cockpit Equipment Product Manager. “It is important to match the customers’ needs to the possibilities of the latest technologies“.